Scenes from hell ooze onto the streets of Santiago as thousands of zombies embark on their annual walk through the Chilean capital. Tara Cleary reports. Some were hostile … others a little vacant. 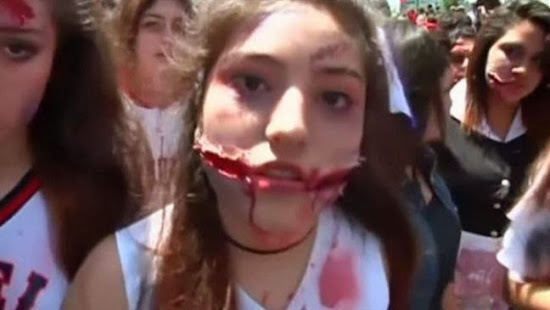 But everybody got gory for Santiago's Zombie Walk. More than 15,000 "undead" emerged to promote equality and tolerance of zombie culture. SOUNDBITE: Javiera Rumen, student, saying (Spanish): "I was attracted to it because it is super fun, you have a great time. I'm not that young, but I feel like a little girl." SOUNDBITE: Catalina, girl dressed as a zombie, saying (Spanish): "It is very entertaining, I hadn't been here before. I came here to know more about it and to get out more and not stay home every day." The Chilean capital is one of several cities around the world which celebrates zombies in a gruesome annual parade. Syarikat jualan langsung unggul yang membawa kepada anda satu kerjaya … untuk terus berjaya. Nikmatilah kehebatan rangkaian produk dan keistimewaan pelan pemasaran kami untuk kehidupan yang lebih bermakna.